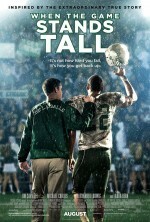 “When the Game Stands Tall,” a movie based on the true story of football Coach Bob Ladouceur and the record-breaking 151-game winning streak with the De La Salle High School Spartans in Concord, California, will be released nationwide on August 22, 2014. Ladouceur is not only known for the winning streak, but also for teaching life lessons to his players on and off the field. “When the Game Stands Tall” demonstrates the real-life adversity faced by the team and the challenges they had to overcome, while showcasing the importance of teamwork, sacrifice, and commitment, as well as the core values of the Lasallian mission. Several groups attended pre-screening events, including members of the Lasallian Educational Council (LEC) on June 24 at a theater in Maryland while meeting nearby in Washington, DC. Participants of the Brother John Johnston Institute of Contemporary Lasallian Practice and the Buttimer Institute of Lasallian Studies, as well as those at the Lasallian Volunteers Orientation, were also invited to an advanced viewing.